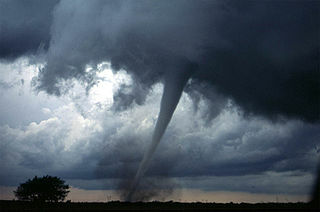 One of several tornadoes observed by the en:VORTEX-99 team on May 3, 1999, in central Oklahoma, U.S.A. The word "respect" comes from a Latin word meaning "to look back at." Respect is a kind of knowledge we have from experience. We look back at our experience and choose to act in a certain way. As you grew up you learned a lot of different kinds of respect. You learned to respect fire and so now you are less likely to be burned. You learned to respect strange dogs so now you are less likely to be bitten. You watched your parent's reactions and learned to respect tornadoes and lightning storms. Respect is not the same thing as enjoying or liking something. Respect is a way of understanding something's (or someone's) nature. Respect is related to but different from love. Respect is always a part of appropriate love but you may not love each of the things you respect. I respect and value fire but I do not love it. I respect the power of a tornado but I detest the damage and death it can cause. As you developed and learned to love you learned of many kinds of love. You may love ice cream, you may love kittens, and you love your Mom, but you treat each of them quite differently. Because of the nature of your age you are now also learning about romantic love. A major and difficult part of becoming a Christian adult is connecting respect and romantic love. This connection between respect and love is also a part of our learning to honor God. Honor is different from respect and love but is also entwined with them. To honor someone or something, you must first respect it and we hope you would have affection for it or even love it and then you act in a way that expresses that respect and affection. Honoring our country means understanding what our national strengths and weaknesses are and expressing that respect by standing for the pledge of allegiance and also being willing to work hard to correct our country's failings and weaknesses. To honor someone you have romantic feelings toward means to recognize their strengths and weaknesses and protect, defend, and praise appropriately. Respect is the knowledge that results from knowing something's nature. Love is the feeling caused by mutuality, familiarity, or desire. Honor is the expression of admiration, or esteem we offer because of our respect. Honoring God then requires that we know God. This can be difficult because we are always learning more about God. Our knowledge of God is always partial and we hope always growing. In an older time the phrase often used instead of "honoring God" was "fearing God." This phrase indicated that the individual had a knowledge of the power of God, but this phrase seems to minimize the believer's love for God. It is true that it may be possible to honor someone without loving them. (For instance, people who live under a vicious dictatorship may respect the power of the tyrant and may say and do many things to honor that dictator to save their lives, but still detest the dictator at the same time.) However, just as we are working to unite respect, love, and honor in our romantic relationships, we are always hoping to unite respect, love, and honor in our relationship with God. In the ancient Middle East, honor was shown to rulers by touching one's head to the ground when in their presence. This was an ancient way of showing honor. In ancient Rome and feudal Europe, a whole form of address developed for a person to use when speaking to a superior. Terms like "Lord," "Lady," and "Sir" came to be a shorthand for reference to someone who had rank over you. Our use of "Lord" in reference to God is an outgrowth of this way of understanding the world. Part of the Reformation was the Protestants' rejection of the hierarchy of priests and bishops which stood between the average believer and God. This concept of equality before God is a direct ancestor of the concept of equality before the law and equality within a democracy. This is a movement that has plowed through our denomination as we recognized the public ministries of women and addressed problems of racism, and it is still churning within our denomination over the qualifications for clergy and elders. We are still discovering what it means to be equal before God. But the rethinking of relationships caused by the rejection of feudalism in our religious thinking challenges more than just our relationships with other persons. In our individual prayers an overuse of the terms "Lord" and "Father" for God may be a way of reinforcing an image of patriarchal hierarchy—an image of God as bullying war lord. Today in some churches, parishioners kneel during certain parts of the service just as they would kneel when in the presence of a monarch. Is Jesus our monarch or our brother? In our tradition, we usually do not kneel in submission during worship but sit as at a feast with God as the host. These questions about posture are part of our continuing struggle to develop appropriate ways of honoring God. Today at churches around the world, we are struggling with how to show honor to God in ways that do not relate back to abusive forms of government and archaic understandings of honor. What are the principles we are trying to hold on to even as we develop new ways of showing honor and love to God? The examples in the Bible of how people of faith in earlier times understood honor to God always reflect the political and social understandings of that time. What principles can we find in Scripture that transcend those cultural understandings? 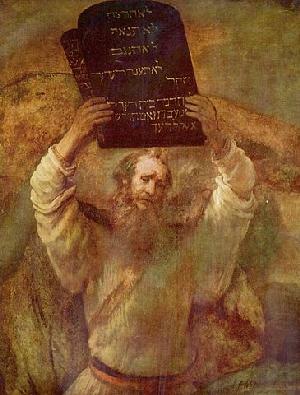 Rembrandt Harmenszoon van Rijn, Moses with the Tablets of the Law, 1659, Staatliche Museen, Berlin, Germany. What are the principles in the Bible which are not reflections of their historical settings? This is still an open question and may never be answered satisfactorily, but the Ten Commandments are a good start. In Presbyterian Churches the two tablets of the Ten Commandments are often divided into: 1-4 which deal with our relationship with God and 5-10 which deal with our relationship with others. Different traditions divide the commandments in different ways. For a discussion of those differences look here. You shall have no other gods before God (Exodus 20:3; Deuteronomy 5:7). You shall not make an idol (Exodus 20:4; Deuteronomy 5:8). You shall not make wrongful use of God's name (Exodus 20:7; Deuteronomy 5:11). You shall remember the Sabbath Day and keep it holy (Exodus 20:8; Deuteronomy 5:12). Reflection: This commandment, and the story that underlies it, makes it unique. In the account of the creation of the universe, God chooses to rest on one day in seven. If God is all powerful, this cannot be because of weariness. It is instead a period of reflection. Jesus says that humans are not created for the Sabbath but the Sabbath was made for humans (Matthew 12:1-8, Mark 2:23-28, and Luke 6:1-5). We should keep the Sabbath separate from other days as a time for worship and reflection. Put God first. The question is not how we refer to God or our posture when we pray. We honor God when we recognize that God has the first claim on us. Don't limit God. God's power, goodness, and love are always greater than our imagination. We honor God when we do not impose our class or culture's biases on God. Don't try to use God. When people use God's name to advance their own aims whether by using God's name in a curse or using God's name to advance a sectarian political view, they dishonor God's name. We honor God by praying for God's will to be done not by using God's name to bully people into doing our will. Sit quietly with God. We honor God when we stop our normal routine and take the time to remember who we are and whose we are. This is a logical time for praise and fellowship.